Bring your family, bring your friends! 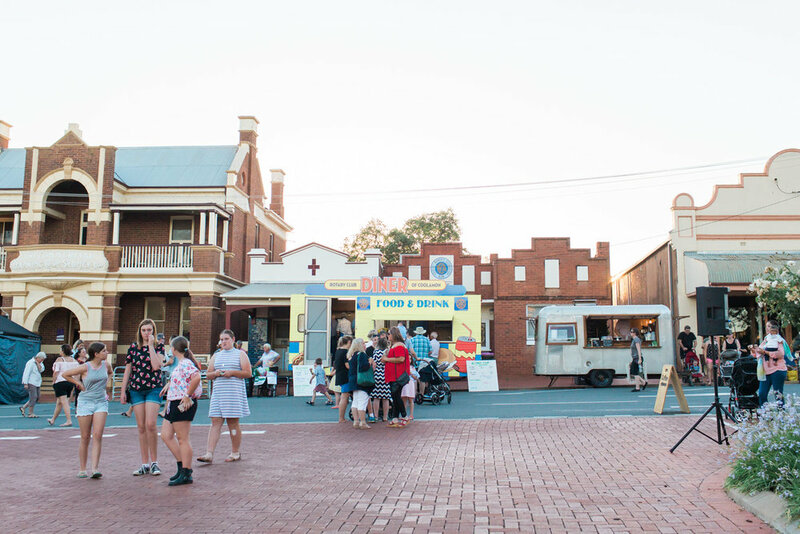 Join us for a family fun street party packed with activities and entertainment. This year you'll be able to watch the sun go down with Who’s the Boss Party Band! Playing all of your favourites from 6pm – 10pm. The kids activity zone will be packed with a range on offer including…. Children's wristbands will be available for purchase on the night at a cost of $10 per child or $25 per family (3 children), which gives kids access to all of the activities and amusements until 9pm. 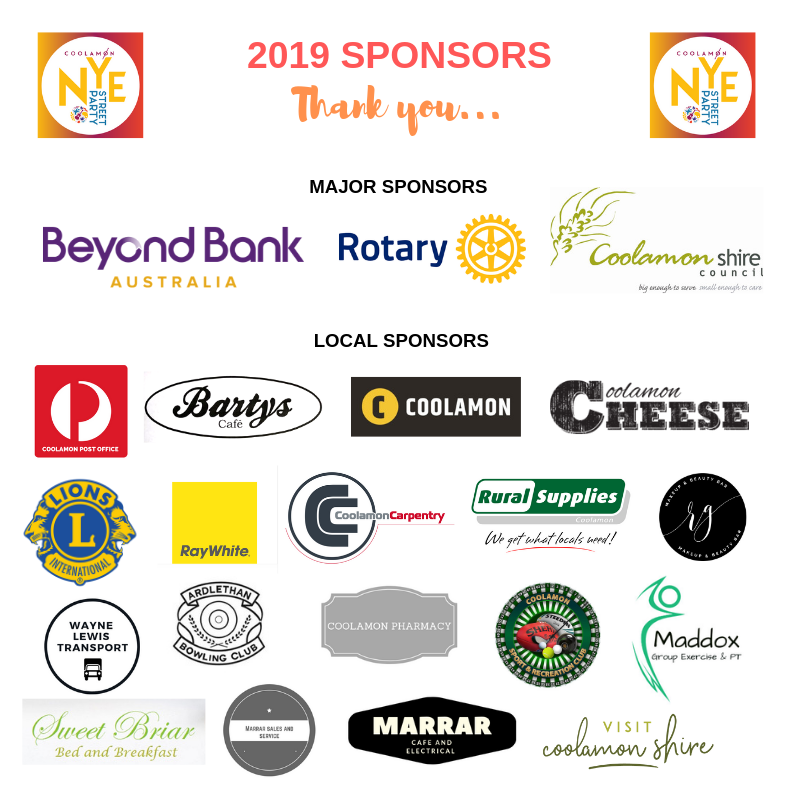 Wristbands are available for pre-purchase at the Coolamon Shire Library for the month of December leading up to the event. The sky will light up at 10pm. 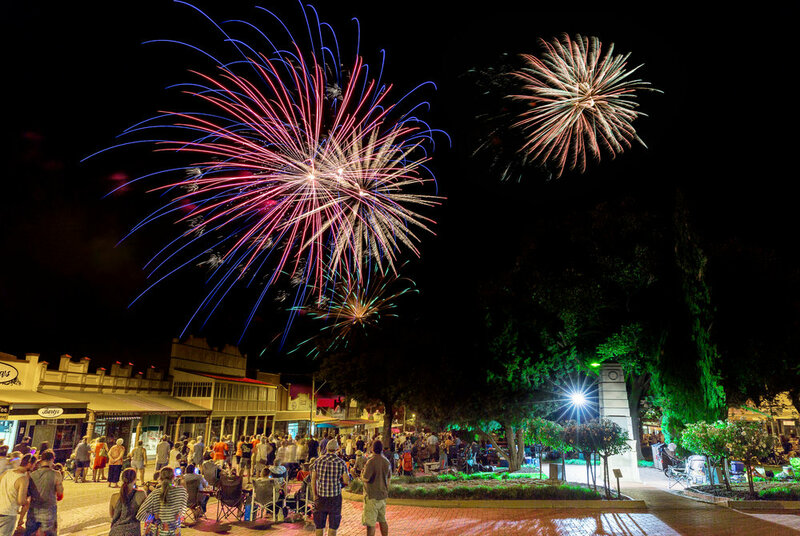 Don’t miss the family fireworks spectacular proudly sponsored by Beyond Bank and Coolamon Shire Council. 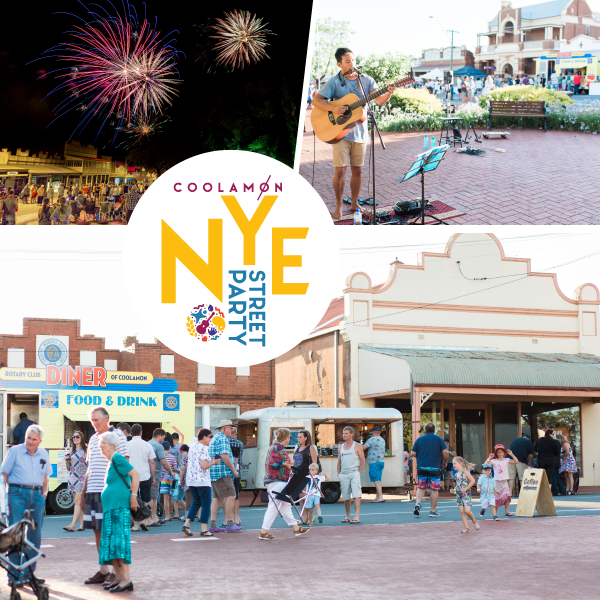 The Coolamon NYE Street Party has many entrances, this is a public event and we encourage all attendees to take care when making your way through the event area. Please watch for different surface levels and any uneven surfaces. Cowabbie Street (the main street), is closed to traffic for the event. Traffic closures will commence at 4pm and will reopen to traffic at 11pm. Appropriate traffic detours will be in place during the event. The event closes at 10:15pm. Parking is available in the nearby streets, please be considerate when parking outside residential properties. Security will be at the event. If you have any issues, please make contact with security officers. Police will also be present throughout the event. The First Aid tent is situated on the eastern side of Cowabbie Street. Please visit this station if you are feeling unwell or have injured yourself at the event. First aid is provided by ‘Get First Aid’. The alcohol free zone has been lifted for this event, please remember this is a family friendly event and responsible drinking should be carried out at all times. This is a BYO event, as well as drinks available from the Royal Tavern. If you are driving to the event and are planning on enjoying a few drinks, please walk home or arrange a responsible driver at the end of the evening to get you home safely. Remember to stay hydrated during these warm days. A water fountain is available in the top end of the middle island, towards the Fire Museum. Don't forget to slip, slop, and slap! Sunscreen is available from the information tent. Unfortunately many animals are terrified by firework displays which can indirectly pose risks to animal safety. We encourage you to make appropriate arrangements for your pets during the fireworks display. The RSPCA website and information page about ‘How should I care for my pets during fireworks displays?’ provides useful information. Sarah Boyle will be this year’s event photographer. Sarah will be roaming around the event taking photos. 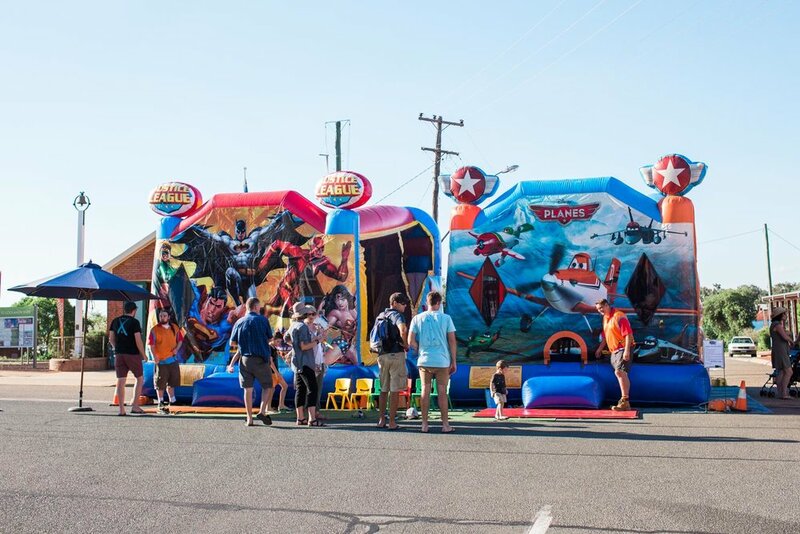 While there is plenty of fun activities for kids to enjoy at the event, child safety is very important. Parents are encouraged to care and watch their children throughout the evening. A first aid tent is available on site if required. If you come across a lost child, please make your way to the information tent. It is encouraged to write the parent’s phone number on the child wrist band provided when paying for the kids zone. That way you can be easily contacted if required. Extra bins are available throughout the site, please place your rubbish in the bins provided and clear your picnic area at the end of the evening. - Cnr Mann Street and Cowabbie St, near Delta Ag.